Together we make mission and ministry happen! 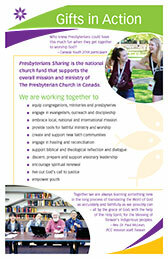 Presbyterians Sharing is the national church fund that supports the mission and ministries we do together in Canada and around the world. Presbyterians are sharing in a wide range of ministries from encouraging and equipping congregational renewal and development, to supporting inner city, native, refugee, urban, remote and chaplaincy ministries in Canada, to sending mission personnel to work with international partners. Questions about Presbyterians Sharing? Contact us today by email or call 1-800-619-7301 ext. 267. Have you been wondering about the meaning behind the new Presbyterians Sharing logo? The fish was chosen because of the early church’s use of the fish as a symbol of Christ and the Christian faith and church. It also recalls both the miracle of sharing (loaves and fishes) and the commission to be “fishers of people.” There are eight fish, which represent the eight synods in the PCC. Theologically, the number 8 refers to the 8th day (day of resurrection), which invokes the “new creation”—the reconciliation and renewal of all things. The circle represents gathering, inclusion, unity, wholeness and the perfect everlasting nature of God. The fish are gathered together to signify our working together in collaboration. The colour purple invokes the colour of majesty and reminds us both of Christ’s rule but also the kingdom we are to build on earth. The design includes two variations of the cross—the Greek cross (+) and the St. Andrew’s cross (x). All resources are free of charge. To place an order, complete the online order form , send an email or call 1-800-619-7301 ext. 331. Click here for additional resources. Thank you for your generous gifts in 2018! Share this short video at your Annual General meeting, or use as a moment for mission during worship. This video highlights some of the ways in which gifts to Presbyterians Sharing are making a difference, in Canada and around the world. 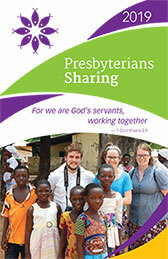 Share it at your congregation’s Annual General Meeting, on Presbyterians Sharing Sunday, or as a moment for mission. The “One Mission, Two Funds” video highlights how gifts to Presbyterians Sharing and PWS&D are sharing Christ’s love in Canada and around the world. Use photos for bulletins or PowerPoint presentations. Go to the Photo page.